Last winter I replaced the injectors as we had started to see an increase in fuel/soot residue on the transom. Typically when we see this it’s indicative of worn injectors. I started by removing the small black rubber return fuel lines from each injector. The lines were dry rotted, while not leaking, they were in bad shape. I found some fuel hose that would work in Martinique but I plan replace all of the lines with properly sized line and new clamps when we return this winter. Next I removed the rigid high pressure fuel lines, unscrewing the nuts on the injectors as well as on the injector pump. I then removed and replaced one injector at a time. 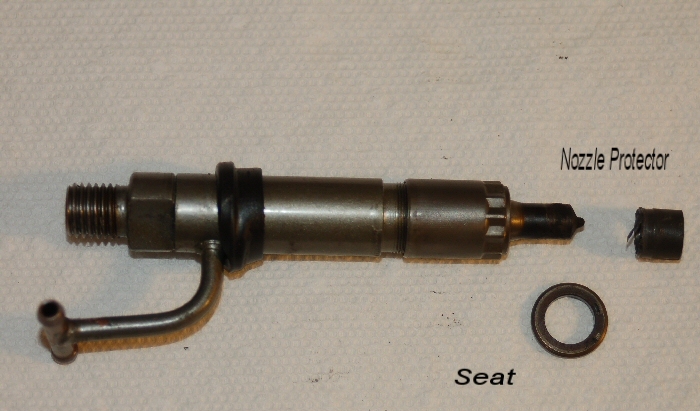 The injectors are held in place by a bracket and two bolts. The bolts and bracket are removed and then the injector can be extracted using a pair of pliers using a slight twisting motion while pulling. Each injector also has a nozzle seat and a nozzle protector that have to be replaced. The nozzle seat fits over the nozzle protector and the protector has one end that is camfered – this end slides on the injector nozzle first. I replaced each injector, retorqued the injector hold down bolts and then reconnected the rigid high pressure fuel lines and the flexible return fuel line and clamps. I then started the engine and it was running rough as there was air in one or more injectors. I manually bled each injector by slightly loosing the high pressure hose at the top of the injector till some fuel bubbled out and then retightened. After bleeding all three injectors the engine was running normally again.